Only 30 minutes north of Manhattan, Castle Hotel & Spa sits majestically atop one of the highest points in Westchester County overlooking the Hudson River amid sprawling acres of manicured gardens and grounds. 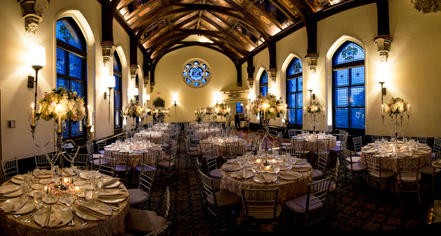 With over 100 years of history, the Castle is undoubtedly an indulgent escape from the hectic pace of the Big Apple to the enchanting era of America’s Gilded Age. The Castle has 31 luxurious guestrooms, suites with wood-burning fireplaces, and lavish amenities, which continue to be a favorite among dignitaries and celebrities. Convenient to Manhattan and Westchester corporate centers, Castle Hotel & Spa features 3,300 sq ft of efficient, comfortable, and flexible meeting space in a distinctive setting. Three unique settings provide privacy, technology, and attentive service to support every agenda. Ideal for board meetings and executive retreats, the professional staff can help plan every detail of a meeting from start to finish. Following an extensive renovation, from the Neo-Classical style of the Library to the spectacular 1,500 sq ft Great Hall with fine architectural details and intricate vaulted ceilings to the elegant Caramai Ballroom with its crystal chandeliers and abundant natural light, Castle Hotel & Spa excels at planning and executing corporate retreats and executive conferences. High-tech meeting technology assists in accommodating every need for a successful and productive meeting of almost any size. 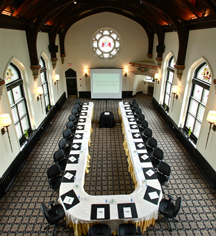 At just 30 minutes north of Manhattan, the Castle Hotel and Spa is a perfect choice for corporate and social events. Enjoy comfort, flexibility and convenience in a historical and breathtaking setting. The event planners and culinary team of this historic New York hotel, can help you to create a memorable experience for your guests or participants.